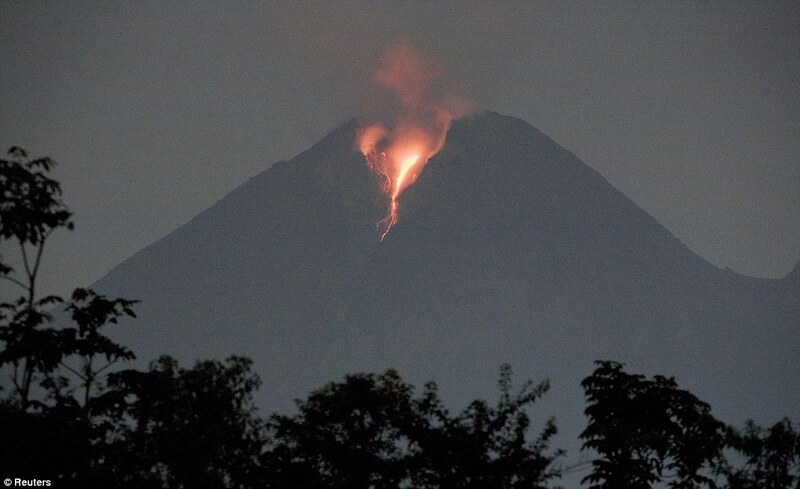 Indonesia's Anak Krakatau volcano in Sunda Strait, straddling East Java and Sumatra, has spewed ash and flaming rocks. Officials raised alert levels to 'high' on Friday as the volcano showed signs of increased activity, producing 117 small eruptions. Staff at the observation post in Pasauran, Banten Province are on a 24-hour watch. Residents in Pasauran have been told to stay at least two kilometres away from the volcano. Anak Krakatau means 'Child of Krakatau', named so because it rose in the place of Krakatoa volcano after it blew itself apart in one of the most destructive eruptions in history in 1883. The area is a popular tourist site and many villagers farm on the slopes of nearby Ibu Krakatau (Mother of Krakatau) on the same island. "Until now we are still on alert level but when we examined our equipment on October 27 and 28 we experienced tremors," said Anton Priambudi, a volcanologist observing Anak Krakatau. Several volcanos in Indonesia increased their activities recently following Mount Merapi's eruption on Tuesday. 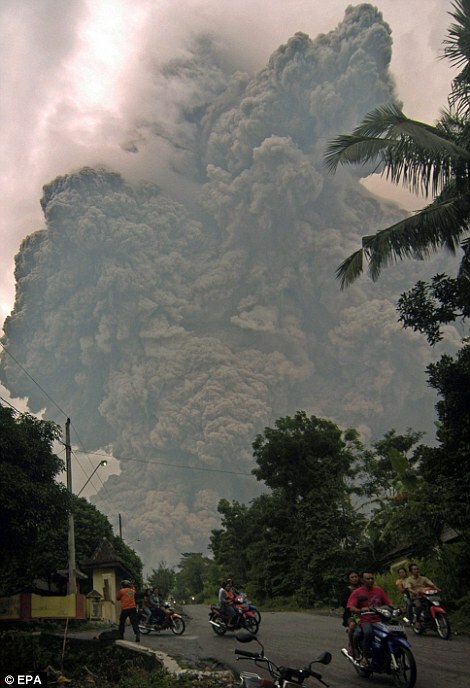 The eruptions came only a day after a tsunami struck the remote islands in western Indonesia. It is likely that the cause of this catastrophe was the eruption of the super volcano Krakatoa. (Note: The terms "Super volcano" is used for a volcano with hundreds of times the power of any that we have visually recorded in the past few hundred years. Use the term "super volcano" for further research). We now have two super volcanoes showing signs of getting ready to erupt. Each is bigger than Krakatoa. One is in Naples Italy and the other in Yellowstone USA. CVGHM reported that during 1 June-1 September observations of Anak Krakatau were often prevented by fog; occasionally diffuse white plumes were observed rising from the crater in June. Seismicity increased significantly in August. On 2 September seismicity again increased, and at 1830 a Strombolian eruption ejected lava 200-300 m above the crater. The Alert Level remained at 2 (on a scale of 1-4). Residents and visitors were warned not to approach the volcano within 1 km of the crater. Based on analyses of satellite imagery, the Darwin VAAC reported that on 3 September ash plumes rose to altitudes of 2.4-4.3 km (8,000-14,000 ft) a.s.l. and drifted 35-95 km N.
Clouds of volcanic ash from Anak Krakatau, or child of Krakatau, have become so prominent in recent days that Indonesian authorities have issued a warning for local residents and tourists. “The ash was carried by wind from the southeast to the south, reaching Bandarlampung,” Nurhuda, head of the observation and information section of the Meteorology, Climatology and Geophysics Agency (BMKG) in Lampung province told state news agency Antara. The major population center of Bandarlampung is the capital of the Lampung province and is the same distance from the volcano as the Indonesian capital of Jakarta. “We also advise fishermen and tourists not to come within a radius of 3 kilometers of Anak Krakatau. The thick plumes of smoke sent off by Krakatau contain toxic material that is hazardous for your health,” said Andi Suhardi, head of the Anak Krakatau observation post in Hargo Pancuran village. Officials advised residents to wear masks when traveling outdoors to protect themselves against the ash. Short term effects of volcanic ash could include respiratory discomfort, including nose and throat irritation. Those with pre-existing respiratory conditions could be susceptible to more long term effects. Observations of Anak Krakatau could be hinting toward a major eruption as the volcanology office in Bandung has recorded almost 90 eruptions per day over the past week. In addition, Nurhuda added that the volcano has been observed spewing red hot lava up almost 1000 feet above its peak in recent days.